LG Optimus Black Wifi Direct Feature Explained! Grab Your Unit Now Via Online Promo! By now, all of you should know how much I love the LG Optimus Black. And why not? This phone is just incredible. Sure, the Optimus 3D and the Optimus 2X are currently the flagship handsets of the Korean company, but LG Optimus Black is by no means a slouch. The ultra-slim form factor, the super bright and stunningly crisp NOVA display (Remember: LG makes Apple's Retina Display for the iPhone so it makes sense to expect nothing but the best from the display on LG's own phones), its 5 MegaPixel camera and HD video capture capability; All these features, among many others, combine to make LG Optimus Black probably the best midrange Android phone out there. And it's true. For those who can't afford the more expensive dual core slim phones, the Optimus Black gives us an option to get that slim body, bright screen, and responsive experience in our pockets for a fair price. One of the cool features of LG Optimus Black that I recently discovered is Wifi Direct. Simply put, Wifi Direct enables users to have wireless transactions between two Wifi-capable devices - with one or more having Wifi Direct feature - allowing transfer of content like photos, music and videos at the speed of up to a whopping 20MB per second! It's just super fast! And you don't have to worry about going through a router, you can just connect the devices directly. Think of it as being similar to Bluetooth pairing and sharing but with wider range and greater speeds. 1. 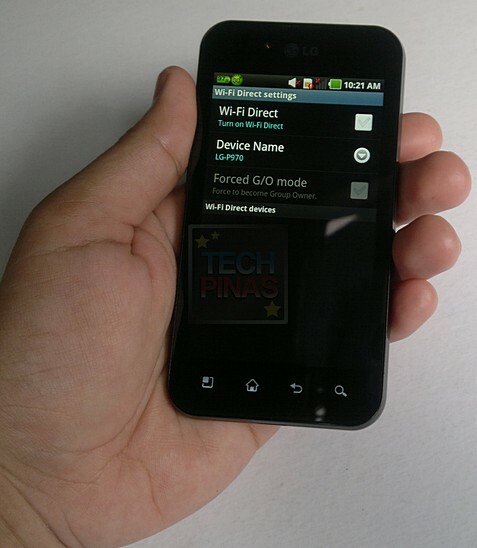 On your LG Optimus Black, turn on Wifi Direct by going to Settings, then Wireless and Networks, then tick on the Wifi Direct box. I find this feature particularly useful in weekend gimmicks with friends where everyone has their own phones and are taking their own photos of the whole barkada having fun. Before parting ways, we usually share photos via Wifi-Direct on my LG Optimus Black. I don't have to worry about slow sharing because 20MB per second of transaction between our devices should be more enough to make sure everything happens in a zilch. After that, I can start sharing our photos on my social networking sites with a few clicks using Facebook for LG Phones and Twitter for LG Phones, which are well integrated into the whole Android experience on my LG Optimus Black. So, are you interested in getting LG Optimus Black for yourself or your loved one this Yuletide? Well, you better act now! LG has an on-going Optimus Black Online Promo from October 24 - December 18, 2011, which lets you get the LG Optimus Black for only Php 15,990 instead of the Php 17,990 regular SRP; Yes, you can get a whopping Php 2,000 discount only via this exclusive online promo and you're also sure to get LG-certified warranty and after-sales support that you can't avail of elsewhere. To get the discount, just log on to lgoptimus.ph on November 21-30, December 2-8, and December 9-18, 2011. Php 2,000 is already a big discount considering all the features you're getting with LG Optimus Black; add a bit more to it and you can a new pair of jeans for Christmas, or if you want, use the money to buy several new shirts for the new year. It's all up to you. Check out LG Optimus Black NOW!